Memorial Day is almost here and that means that The Swim Club will be in full swing! 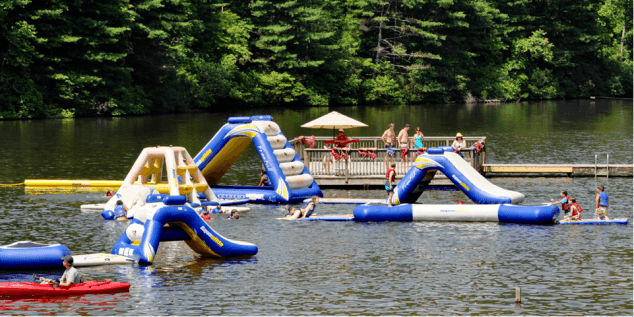 Our kids always love coming to Big Canoe throughout the year, but with the addition of the inflatable obstacle course right off the beach of Lake Disharoon next to the rock slide, there are now two times of the year that they cannot wait for. Yep, you guessed it, Christmas and Memorial Day! Of course, the obstacle course is not just for the little kids. I have seen some of the moms and dads take part in the action. With the 110,000 gallon free form pool, bbq area, and all of the other water activities like paddle boarding, kayaking, paddleboats and canoes, this is certainly one of the biggest draws for Big Canoe residents. So grab your sunscreen and have some fun at The Swim Club this season.